Another new title from the Jonathan Kellerman keyboard. A child psychologist, he writes psychological thrillers as well as more erudite non-fiction items. His latest novel is The Conspiracy Club (Headline Book Publishing, 2003, ISBN 0-7553-0733-X) and is a story about a young psychologist, Dr. Jeremy Carrier, who becomes involved in a modern day Jack the Ripper investigation. However the involvement goes much deeper than a cursory overview, as Dr. Jeremy finds himself becoming one of the key players. In fact one of the key suspects. Kellerman introduces a girlfriend for Dr. Carrier. A plausible and ‘ordinary’ relationship in many ways, until the girl is most brutally murdered. Carrier is stunned, but because of his own background, and his training, does not appear as the grieving, bereft human being that the police detectives expect. It is this that points the accusatory fingers in his direction, a situation of which he does not truly comprehend all the implications. After this, young Dr. Carrier is approached by a retired ex-coroner and pathologist who slowly begins to give his young colleague a push in the right direction, but by very peculiar ways. He is invited to be part of a macabre group of people, intellectuals all, but with dark and evil deeds in their past. Pasts that they have attempted to lock away. As the convoluted story unfolds, Dr. Carrier forms a romantic association with a young intern, and Kellerman describes Carrier’s own psychological problems as he wrestles with his feelings of guilt related to his deceased girlfriend and his new attachment. Unable to fully accept the second one without psychologically dealing with all the emotional baggage from the first, he struggles to help himself, despite his qualifications and apparent abilities to help others. Towards the end, Dr. Carrier is able to allow himself to be ‘humanized’ by the young intern, enabling his own true feelings to come out, including that of jealousy, which serendipitously points him in the correct direction as far as solving the murders (there’s more than one!). 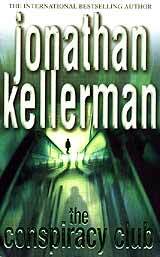 The final scenario, author Kellerman does give clues to, but not until the last few pages. Enthralling to the end. The novel fits the mystery genre very well, as it certainly does keep you guessing right to the last few pages. It is also a detective thriller, a psychological expose and a love story. It is hard to imagine all that wrapped between the covers, but they are all there. For me it began a trifle slowly, with what seemed to be an excess of minutiae but every little piece was needed, particularly when Kellerman wants to draw a few shoals of red herrings across your bows! However, by the time you come to the last few chapters it is moving along so fast you almost have to put the book down for a few minutes, just to let your brain catch up with the pace of the information being thrown at you. I really enjoyed this book. The review copy was supplied by Bookazine and The Conspiracy Club should be available at all good bookstores. The RRP was B. 395. By the time ‘The Who’ unleashed their new album to the public, it had been over two years since the release of their previous studio work, the double album of the rock opera ‘Tommy’ (1969). During these intervening two years ‘The Who’ had released a stunning live album called ‘Live At Leeds’, which was to set the benchmark for all live albums that were to follow. They toured almost continuously - with headlining appearances - at such major events like ‘The Isle of Wight Festival’ (twice) and Woodstock. The latter gave the band immortality on the silver screen when the movie of the 3-day event was released to cinemas worldwide with the centerpiece of the music being ‘The Who’s’ finale of the opera. After two years (a long time in rock and roll) the band was desperate to get something recorded in the studio that was more representative of what the band was like at the time live on stage. The young Vic Theatre was rented, the Rolling Stones mobile recording studio was moved in, and old mate Glyn Johns was brought in to help with the production. Each week the band would give free concerts for an invitational fan club only audience to try out the new material they were recording. The results were simply devastating, from the opening ARP Synthesizer of ‘Baba O’Riley’ to the final crashing chords of ‘Won’t Get Fooled Again’. This is rock music that was hard-edged, brazen faced, steeped in East end class. ‘Who’s Next’ was without doubt a triumph for ‘The Who-le’ band. Roger Daltrey’s singing was uniformly superb with vocals ranging from the raw power and screams of ‘Won’t Get Fooled Again’ (anybody who has ever seen this song performed live will never forget the bellow of celebration that Roger Daltrey lets fly as the band breaks back in for the final verse), the moving delicacy of ‘Behind Blue Eyes’, to the altogether more demanding material such as ‘The Song Is Over’, ‘Getting In Tune’, and ‘Goin’ Mobile’. Across the full scope of this material Daltrey’s range and power are tested to the limit, resulting in one of the most commanding vocal performances in rock history. I ain’t been home since Friday, and now she’s after me. John Entwistle brought his usual stunning bass playing to the sessions, enhancing the songs immeasurably with not only a solid foundation, but with effortless melodic frills. Keith Moon’s drumming was as supercharged as ever, but more disciplined and precise. The full expansive range of Moon’s drum kit was recorded with depth, clarity, and power. Almost making him the star of the show. Peter Townshend confirmed his status as one of rock’s master guitarists, providing rich acoustic textures, inspired lead work and his unrivalled use of power chords. He sang often and well, too. The contrast between Daltrey’s up-front power and Peter’s mellower refrains gave ‘The Who’ a unique vocal attack that invested songs like ‘Baba O’Riley’, ‘Bargain’, and ‘The Song Is Over’ with a more thoughtful cerebral slant. ‘The Who’ functioned not only as a creative experimentalist, but as a visceral guitar-driven rock and roll band. (Listen to ‘Bargain’ for instance, to hear one of the most dynamic ensemble rock performances ever recorded.) 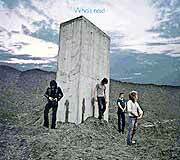 ‘Who’s Next’ offers prime evidence that the real power behind ‘The Who’ was the cohesive unity of all four of its members in equal parts. With the new Deluxe Edition of ‘Who’s Next’ you get six of the tracks from the aborted New York recordings (I am sorry boys, but the version of ‘Love Ain’t for Keeping’ was better the first time round), plus on the second CD a complete concert from the young Vic. The band plays all the new songs (with only the odd nod to the past) at full pelt and with more verve and freshness than a Ferrari. You also get a 40-page booklet with all the facts and figures, packed full of color photographs, and two reviews of the album from Peter Townshend and John Atkins. Certainly a superior re-release of one of rock music’s finest moments.